Wear your heart on your sleeve with two adorable Original Gent watches. Catch My Heart (GZ264) is ruby red and features a small white figure, emerging from a scarlet rose sketched on the dial. The embodiment of new feelings, a promise, a future...? Whoever gives or wears this watch will find out soon enough, as the hours and minutes glide by in white. To give love an extra chance, the red silicon strap also bears the words “Only you!” Positioned just beneath the dial, near the beating heart of the watch, the message hugs the wrist. It is also time for romance with Lovely Mine (GZ265), the second Original Gent, with its delicate pink design. 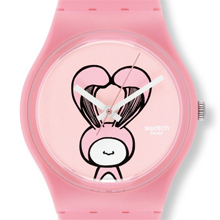 The pink dial is home to a cute character in a rabbit costume, the ears of which join to form a heart shape. The little guardian of feelings kept secret becomes the messenger and whispers the sweetest words to the chosen one. Not even Cupid, with his arrows, could inspire more love! The pink strap confirms the tender declaration with “I love you!” written below the dial. The gift of one or both of these watches could be the start of a beautiful love story with the aim of creating pleasure through time. 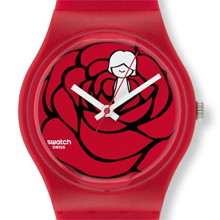 Swatch is presenting these two watches in a Swatch Love Collection Special Set collector's box (GZS50): white, sprinkled with tender words and limited to 777 numbered units. Catch My Heart (GZ264) and Lovely Mine (GZ265) are also sold separately, in special matching packaging. Because you can never love too much, the Swatch Love Collection is completed with stainless steel 316L bijoux, embellished with faceted red crystals. The Glamorous Love trio comprises a heart pendant nestled in steel, which dances on a delicate chain; a simple, pure ring studded with tiny hearts that sparkle with incandescent light; and a set of heart-shaped earrings. The bijoux flash with fiery red, like love.